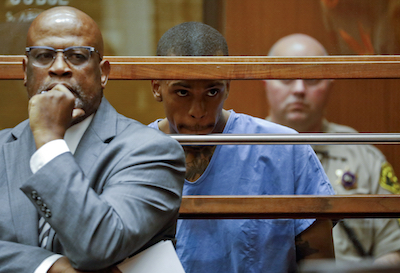 LOS ANGELES—Family and fans of Ermias Joseph Asghedom, the rapper known as Nipsey Hussle, may have breathed a little easier with the arrest of his alleged killer. The 29-year-old suspected shooter is due back in court May 10 to set a date for a preliminary hearing to determine if there is sufficient evidence for him to stand trial. The alleged shooter may be the most hated man in the city as thousands continue to despised the fatal shooting of the hip hop artist and community builder outside his store in South Central Los Angeles. Dressed in a blue jail uniform, Eric Holder pled not guilty to all charges during his early April arraignment. He faces one count of murder, two counts of attempted murder, and one count of possession of a firearm by a felon. “The streets are still numb. It don’t take away the pain that they feel, because in a real sense, they wanted to get him,” said Student Minister Tony Muhammad, Nation of Islam Western Region Representative. “But, he’s off the street. There’s some calm. The family feels pretty decent about it, but the streets is still a little tight, but they’re getting over it. … He’s in the hands of the authorities but they’re still numb about it,” he added. Healing will take some time, said the Muslim student minister, who has been heavily involved in trying to comfort those hurting from the loss and trying to keep emotions and the city from exploding. If convicted as charged, Mr. Holder faces a possible maximum sentence of life in state prison. The case remains under investigation by the Los Angeles Police Department. Coroners said Nipsey died from gunshot wounds to the head and torso on March 31, the day witnesses allege Mr. Holder walked up and fired on the self-made rapper and successful entrepreneur. Mr. Holder fled the scene and was arrested April 2 in Bellflower, Calif., about 22 miles southeast of Nipsey’s Marathon store, police said. He was in court two days later. His bail was set at $5 million. instant, all of the five or so television cameras trained on Atty. Darden and his client were on. In a short, brisk walk from the courtroom to a hallway exit door, Atty. Darden told The Final Call he didn’t have enough information from the prosecutor to speak about the case. He also did not say who was footing the legal bill. Mr. Darden was also the target of anger for representing a man many believe killed a Black icon. “Christopher Darden must be hungry. He must be thirsty; must be in need of some get back; whatever it may be. I guess somebody has to defend the guy, so I guess Christopher Darden will be the guy,” said Big Thundercat, who called Nipsey his lil homie and who has been outside The Marathon Store, where a memorial has been erected, day and night. Meanwhile, the female driver who drove Mr. Holder from the scene has not been arrested, LAPD Public Information Officer Lizeth Lomeli told The Final Call by phone. According to authorities, the driver surrendered to authorities on April 1 and is continuing to cooperate with detectives. Detective Cedric Washington of the LAPD’s 77th Division is investigating the case and told The Final Call by phone that he could not provide too many additional facts. “All of us, the DA’s office and us as investigators are kind of on the same page where we don’t want to release too much information, because what happens is the information gets misconstrued, blown way out of context,” he added. 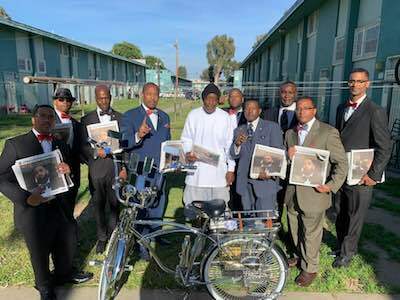 The Fruit of Islam, or FOI, male members of the Nation of Islam in the Western Region under Tony Muhammad and Student Regional FOI Captain Halim Muhammad and his staff, have been pulling over 14-hour shifts, working to ensure the safety of mourners visiting the parking lot memorial. Nipsey was shot outside his store, in the parking lot where he once sold CDs from the trunk of his car. The strip mall, however, was purchased by Nipsey, his family and a business partner with plans to redevelop it prior to his death. Mourners have waited in long lines that wrapped around the block Nipsey bought and others line up across the street and on the plaza sidewalk. Mourners repeatedly sent messages of thanks to the Honorable Minister Louis Farrakhan of the Nation of Islam for Minister Muhammad and “the brothers,” as they are called to help watch over them. 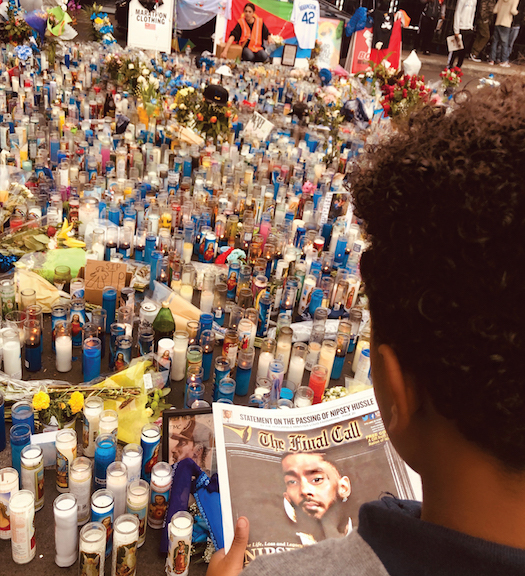 They expressed their thanks directly and in social media posts of videos and images dispatched from The Marathon Store’s parking lot, blanketed with candles, cards, liquor, flowers, empty shot cups, stuffed animals, large wreaths, flags from Eritrea and the Kingdom of Tonga draped across Nipsey’s black Jaguar shown in many of his rap videos. 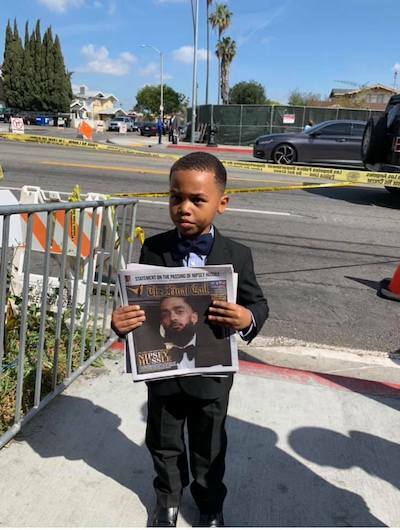 Others shared thanks for 100,000 free copies of The Final Call newspaper which were given away and feature Nipsey on the front cover. 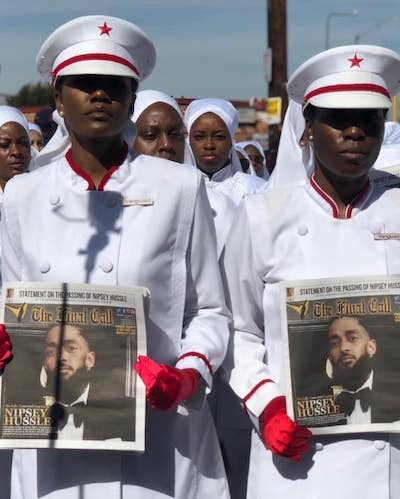 Minister Tony Muhammad and Nation of Islam members from Los Angeles, Compton, San Diego, Rialto and other places gathered April 7 to salute the life and legacy of Nipsey Hussle. Music and talking ceased when the FOI and MGT-GCC, the women of the Nation of Islam, and children marched into the plaza in military ranks. Cell phone cameras were held high to capture videos and photos from across the street, where people waited an hour to get closer to the memorial entrance. When LAPD officers removed barriers, many flooded the streets, sidewalks and stood on a concrete wall to get a view of the Muslims. Minister Muhammad placed a red and blue floral arrangement, in the shape of a star and crescent, laying on a bed of white flowers onto an easel. Beside it, beautifully framed, was a copy of The Final Call with Nipsey on the cover. After the FOI finished filing in, Student FOI Captain Halim Muhammad called “Attention,” then “Original salute!” The Muslims complied and held their salutes for 33 seconds as did some of the people watching. “Brothers and sisters, on behalf of the Honorable Minister Louis Farrakhan and this grateful Nation of Islam, we are here to dedicate this time and moment to one of our great princes, a king, a general,” said Minister Tony Muhammad. He first paid homage to Nipsey’s beautiful queen, actress Lauren London and their son. “We want their family to know that the Nation of Islam, we embrace his family and extended family. We are a part of his hood. We love every Black man and woman, every Brown man and woman, no matter what your state in life is,” said Minister Muhammad. “The Honorable Minister Louis Farrakhan sends his love and his condolences, that from this day forward, our prayer is that God finally has used a human being that can unite the Black man and the Brown man like we’ve never been united before. Let us stop all gang wars in the name of Nipsey Hussle,” he said. “That’s deep,” said a man perched atop a wall. Minister Muhammad told those gathered, that the Nation wants equal membership with the best in civilized society and Nipsey accomplished that by in part opening up businesses for his homies. “That’s love! He put his money, his time, and his efforts to show the hood, not only do I love my brothers, the Rollin’ 60s, but I love all people who suffer,” he said. Minister Muhammad called on listeners to show their love and commitment and allow Los Angeles to fulfill the Bible scripture that the sun would rise in the West in the last days. “Long live the spirit of Brother Nipsey Hussle!” he shouted. Minister Muhammad concluded the tribute with a prayer, thanking God for the unconditional love of a teacher and guide, Minister Farrakhan, and thanking God for sending Nipsey, a soldier and an angel to men. “We thank you that he gave more in 33 years than most of us can give in a lifetime,” he said. Many have tried to halt bloodshed between rival gangs and stop inter-gang violence but the killing of Nipsey Hussle, allegedly by someone from his own group, moved the desire a little closer to reality. Many hurt that a new call for peace happened after his death. Some said his life motivated over 500 so-called gang members to walk in peace several blocks across Crenshaw Blvd., to Nipsey’s memorial. The area is the turf of the Rollin’ 60s street organization. Before then, venturing across turf lines could have meant injury or death depending on tensions and timing. This day was different. Many rejoiced, especially gang members themselves. The street organizations had declared peace and want to expand it. “It’s a great day for a bad situation,” said Big U, Eugene Henley, an OG leader of the Rollin’ 60s who also once managed Nipsey as an artist. The young men came from everywhere to show honor and show respect, he added. Nipsey grew up in the Crip neighborhood and in gang life. The OG’s are respected older men, many have been involved in the gang lifestyle and many have been working to end violence. “I want everybody to just look and see that everybody looks the same, if you take off hats, shoes and colors. We all look the same. We’re the same people. We’re the same people and you won’t know no difference if we take these hats off,” Big U told The Final Call. He granted The Final Call an impromptu, exclusive interview in the center of a joyous but tense occasion, flanked by gang members and surrounded by the FOI. The gangs need to build from here and it’s something Nipsey stood for, he explained. “His music transcended all colors, all genders. He’s a baby of L.A. and it’s our turn to step up. It’s gon’ be hard at first, but we need to just keep fighting. We need to keep fighting until we get it right,” said Big U. He expressed gratitude to Minister Farrakhan for having the FOI in the mix. Otherwise, this could not take place, he said. “It’s so much trust in our community to the Muslims and to the Nation of Islam. We need them to be able to exercise what we’re doing, because they exercise trust. People know when they’re around, it ain’t gon’ be no buffoonery. We need ‘em. I can’t say much more than that. It’s beautiful to have ‘em,” said Big U, as he embraced OG Eight Tray Gangster Crips Madbone, also known as Roosevelt Tellis, and Melvin Farmer. These men were once rivals and today they are trying to promote peace. Since 1979 or 1980 there has been death and bloodshed between these groups. They had not talked since then, said Mr. Farmer. Beginning in 2015, when killings kicked up with a rumor that gangs were vying to kill 100 people in 100 days, those who want to end the violence never stopped working for peace, he said. “From that day, guys have been working towards this, to where Nipsey Hussle’s murder, and tragic, senseless gun violence triggered to where we had to do something. A lot of rumors were out … and these men here helped to watch it, to make this city safe, to make this happen today,” Mr. Farmer continued. The peace work took a unified effort, said Madbone. “First and foremost, I’d like to give thanks to the Rollin’ 60s for allowing us to be here to celebrate this here day, and to me, it’s a celebration. It’s not a death. It’s a celebration. Any time you lose your life, you know, we’re all gon’ leave this earth one day. My goal is to leave this earth just like I am, right now today, making amends with all my friends and all my enemies,” Madbone told The Final Call. Since 1979-80, no one from the Eight-Tray Gangsters had been in the area due to conflict and wider street wars that citywide claimed the lives of some 25,000 people in 20 years, according to statistics cited by Minister Muhammad in his Sunday lecture April 7. He explained how many didn’t have a choice but were born into gang life. “I didn’t fall into this. I was born in this. It hurt my heart when the war started 40 years ago,” he continued. He lamented over one day being able to spend time with a friend at school, then on another, they were torn apart because of gang wars and gang turf. The men called on those outside of gang culture to help and support their stand for peace. Big U called especially on the churches, which he feels have the ability to stop gang violence from the beginning. “Each one of these kids belong to somebody—mother, grandmother, cousin, or auntie—that’s in the church. If you know your baby’s getting into something bad, pull ‘em right there. That’ll help, because what we’re doing right now is the hard work,” he said. Big U remarked that Nipsey’s passing is helping those who work for peace reach across boundaries and into places they didn’t reach before. This blessed moment needs massive support from many, including parents, he added. The urban peacemakers and activists are planning satellite meetings to strategize for increased peace. He touched people from the hard streets of Los Angeles to politicians in the halls of Congress. 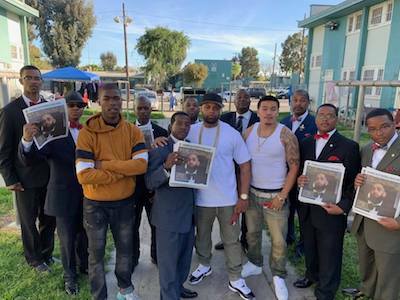 U.S. Representative Karen Bass (D-Calif.), chair of the Congressional Black Caucus announced April 3 that she would formally enter Nipsey’s contributions to South Los Angeles into the Congressional Record where it will be a part of United States history. “Nipsey loved his community and it showed. He was involved in many programs and projects to give back to South L.A., including Destination Crenshaw, which he worked on with Councilman Marqueece Harris-Dawson and others to honor our community with celebration and service,” said Rep. Bass. Since Nipsey was killed, West Coast rapper Kam (Mueed Muntaqeem Muhammad) has been looking for God’s hand in the matter. “He wants us to be so deeply affected, emotionally, by this loss that we all will focus on the good works, the best works; the best of Nipsey’s works and the mind, the mentality that presented them works, that we might desire to resurrect that mind and those works, and duplicate them and multiply them in us … people in Los Angeles, particularly,” said Kam. “Instead of being outraged and want to go retaliate and focus on the anger part of it, or whoever it was that was used to take his life, you know Allah uses our emotionalism to His advantage to make us love him and his works even more and want to ride for him like that, by continuing or resurrecting or duplicating what he was doing,” stated Kam. Donna Henry, 63, lives around the corner from the intersection of Crenshaw and Slauson and stopped by on her way home from Sunday church service. “He was blessed, and the people that knew him probably was jealous of him, but he was a blessed man,” said Ms. Henry. She didn’t know too much about him, but knew that he helped his neighborhood. “The people must have been jealous of him, but hey, we have to learn not to be jealous. We have to learn to respect each and love each other. That’s what our main problem is. We don’t love each other, because the brother gave back to us. Hey! We should have respected him and just loved him,” said Ms. Henry. Davey D, hip hop journalist, activist, and radio personality, said the signal Nipsey’s murder sends is the system can’t be reformed by design. He did everything society says it wants done, from opening businesses, educating students, and employing others but it can’t be reformed because society doesn’t want to be reformed, he argued. “And when I say society and we’re talking about reform, it’s like, Naaahh. We can’t have Black folks who come from these conditions, who are influencers, raise up. It’s like Nipsey, in my opinion—from the outside looking in—is the continuation of what was started in ’92 with the gang truce. You know, people became politicized; people moved in a different direction; people found a way to get some of this together, you know,” said Davey D. “And so the hope that he inspired? That’s dangerous for people that don’t want you to rise up. That’s dangerous for people who are invested in the system not being able to be reformed,” said Davey D.